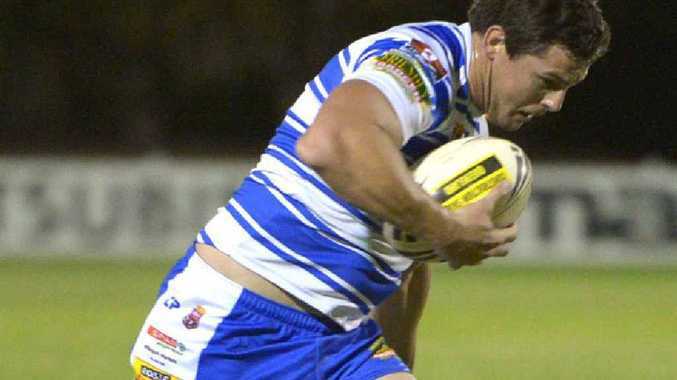 FORWARD CHARGE: Brothers’ Matt Templeman playing against Wests at Salter Oval last year. The Bundaberg Rugby League A-Grade competition resumes today with the grand final rematch between Past Brothers and the Hervey Bay Seagulls at Stafford Park. After a long preseason Brothers are ready to defend their title as they aim to inflict another defeat on the Seagulls. While everyone is eagerly anticipating the rivalry between the two teams, Brothers coach Mat Templeman isn't focused on it. "There's no hype from our end. It's a new season and we need to build now towards September," he said. "We've had a pretty good off-season and we've got lots of new combinations as we head into the season." One of those involves five-eighth Nathan Sullivan who signed for the club in the off-season from the Isis Devils. Templeman has been impressed with what he has seen so far. "He brings plenty of experience and skill to the team," he said. "I can't wait to see him in action for us." Kevin Sherriff will captain the team this season with back-to-back premierships the aim for the team. Templeman added it will be a good time to compare themselves to another strong team in the competition. "Hervey Bay is the yardstick this season, it will be a good test for us," he said. "Some of us had a great time playing Spring Cup for the Turtles. We hope to bring that form with us to the Brothers for this season." Meanwhile the Seagulls are aiming to gain one back against their rivals. Captain Clinton Horne said his team is ready to rip in. The Seagulls welcome several new faces into their line-up including prop Simon Hawthorne and second-rower Kevin Tranberg. Today's match is one of five to be held at Stafford Park today. Maryborough Brothers and Isis Devils will start the day with their reserve grade clash at noon, followed by two more reserve grade games. Wallaroos will meet Wests Panthers in the first A-grade game at 4.30pm with Hervey Bay and Past Brothers scheduled for 6.30pm.